The service you get at McDonald's in Japan is world class. The staff is polite and prompt, and there's still a focus on presentation. So it's a shame that McDonald's just screwed things up. To ensure that each order only takes a mere sixty seconds, there's a minute timer at the register for patrons to watch as the McDonald's employees scramble to slap together their Big Macs. Japanese site Gigazine had better luck than these poor saps on Twitter and described the service as "smooth". Above, you can see what said smooth service looks like (or watch it here). 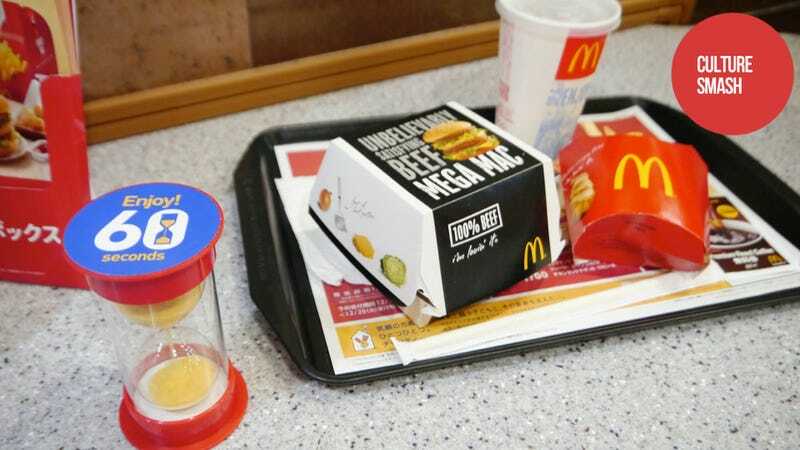 But on Twitter (via Naver), McDonald's customers are also uploading pics of what sixty seconds will do to a meal: besides the generally sloppy sandwiches, there are several photos of burgers sans meat! Some in regions where McDonald's service isn't so great might scoff and say, well, that's what McDonald's is usually like. But it's not usually like this in Japan, hence the complaints. The campaign runs until January 31 and is only available between 11am and 2pm, with certain restrictions on what hamburgers you can order. Still, there are those who are saying the minute fast service simply isn't worth the trouble—especially if that means you might get a burger that is missing the burger part.